Percentage Trailing Stops is a simple trend-following system that trails a stop loss above/below the current price, depending on trend direction. The system uses a stop-and-reverse mechanism similar to Welles Wilder's Parabolic SAR or Average True Range Trailing Stops. The signals are used for exits. Exit your long position when price crosses below the Percentage Trailing Stop line. Exit your short position when price crosses above the Percentage Trailing Stop line. 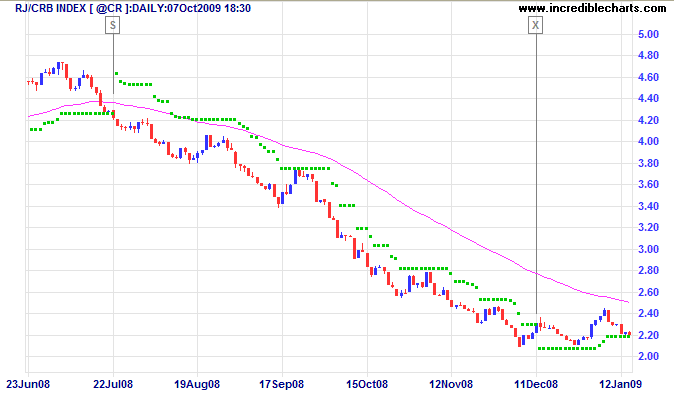 The RJ CRB Commodities Index late 2008 down-trend is displayed with Percentage Trailing Stop (10%, Closing Price) and 63-day exponential moving average used as a trend filter. There is also built in a ratchet mechanism so that ATR stops do not move lower during a Long trade nor rise during a Short trade. If you select the High/Low option, the trailing stop is calculated using the daily High in an up-trend — and the daily Low in a down-trend. More volatile stocks require larger percentages. Down-trends are also more volatile than up-trends and may need wider percentage stops.